Over the past few weeks, I have had the privilege of partnering with a colleague to support his student writers during a mini- personal narrative unit. Drawing from Jennifer Serravallo’s, Writing Strategies Book, we crafted mini-lessons that inspired students to look for story ideas from their own lives, zoom in on the most important moments of those stories and then elaborate using their senses and expressing their emotions. About 70 % of the class dove right in, another 20% came along after a few supportive lessons but the last 10% continued to struggle and resist up until 2 days before our scheduled publishing celebration. The purpose of this unit was to launch writer’s workshop, support these students’ identities as writers and reignite their writing practice after the summer. These fragile writers continued to feel overwhelmed by the blank page. And in a few cases, writing time left them in tears. A draft of my poem written “live” in front of young writers. “That’s it!” I thought. 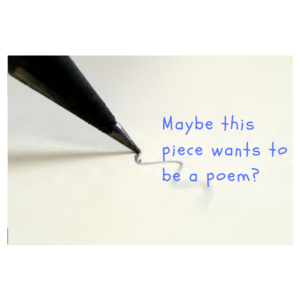 Poetry is accessible for all students, especially our most fragile learners. In the spirit of Ralph Fletcher’s Greenbelt Writing, I knew that these students needed choice. 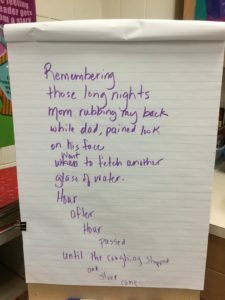 So I discussed it with my partnering teacher and we agreed to ditch the mini-lesson planned for that day and demonstrate how sometimes our writing wants to be a poem. Again, I sat in the gathering area, took my story idea and turned it into a poem. By the end of the mini-lesson, about half the class chose to try it out. For the fragile 10%, the genre of poetry served as an invitation into writing. Smiles replaced tears and their whole demeanor lifted as they looked at the page and saw it filled with their words. On the day of the writing celebration, these students were among the first to volunteer to sit in the author’s chair and share their writing. Being a teacher-writer and writing in the presence of children opens our minds to what is possible. If I hadn’t drafted in front of that class, I might not have had the revelation that sometimes our writing wants to take other forms. Poetry can be a writer’s saving grace! Its short, creative format gives one the immediate sense of accomplishment and pride that comes from having written. All the details you add show how much you care as a teacher of writing. And that deep caring allowed you to find a way to reach all of your writers. Thanks for reminding me, too that genre is a choice that can lead to writing volume and confidence. Thanks for sharing today.